One of the easiest groups of bugs to find and identify are the Shield Bugs. 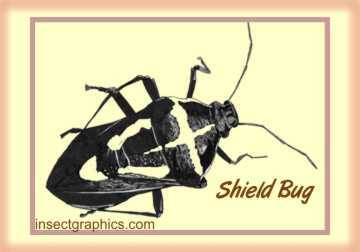 Generally they are flattish oval bugs�shaped like a shield�ranging from 5-35 mm in length. There are over 6500 species worldwide, members of several families. Some are beautifully colored; many are a more practical dull brown or green color. They can be found in almost any habitat you can imagine, and feed on all sorts of plants. They are very similar to Stink Bugs, which can produce a foul-smelling liquid, known to repel certain predators. It is also sometimes released when the bugs are handled carelessly. Most Shield Bugs are phytophagous—feeding on plants—and can become pests when they occur in great numbers. For example, the Harlequin bug (Murgantia histrionica) is a pest of cabbages, and the southern green stink bug (Nezara viridula), found all over the world, is a pest of a wide range of common crops such as tomatoes, beans and cotton. The phytophagous Shield Bugs all have symbiotic bacteria in their guts to help them digest the food they eat. When the eggs are laid, they are smeared with an inoculation of these bacteria to ensure that the young, which eat their eggshell after hatching, have enough of them to digest their next meal. The eggs are laid in clusters, and usually look like tiny barrels. A few Shield Bugs are carnivorous predators and may actually be useful as they feed primarily on pests such as caterpillars and the larvae of leaf beetles.